Reach industry executives who specify, approve and buy services and products for the entire book publishing process including manufacturing, paper, binding, finishing, packaging, publishing systems, marketing, distribution and interactive media. Reach plant managers in the in-plant printing and reproduction departments of industrial, educational, governmental, non-profit and professional service organizations. Reach key fundraising executives at nonprofit organizations. Over 80% of their organizations have annual revenues in excess of $1 million per year. Target key decision-makers involved in the manufacturing of packaging and converting, including Flexible Packaging, Tags and Labels, Folding Carton, and Corrugated Boxes. Influence top and mid-level decision making executives in the dynamic forms and labels industries. 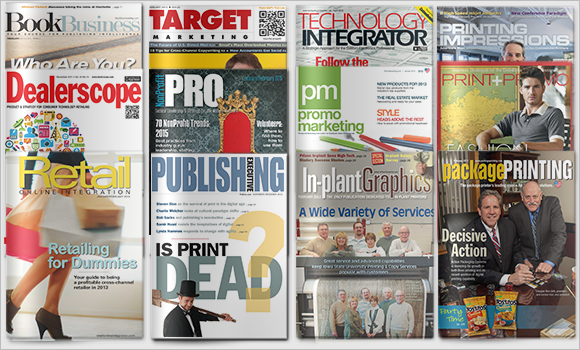 Target decision-makers in the printing, trade bindery and specialty finishing industries. Influence distributor sales professionals in the $19.4 billion promotional products industry. Reach top management involved in all aspects of magazine publishing from production and workflow to SEO and circulation. Reach success driven decision-makers in the direct marketing industry. Reach top retail, etail, catalog, online marketing and merchandising decision-makers.